As the EU prepares to invade Libya with ground troops under the contrived pretext of “humanitarian aid,” Texas University Professor Alan J. Kuperman highlights the fact that the entire justification behind the NATO-backed aggression has been proven fraudulent by casualty figures that clearly indicate Gaddafi has not deliberately targeted civilians. 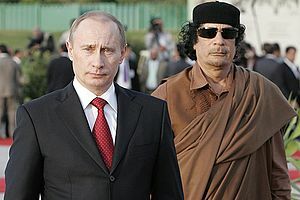 Appearing on Russia Today, Kuperman dismissed the Obama administration’s claim that there would be a “bloodbath” in Libya if there was no foreign intervention, pointing out that there is no evidence Gaddafi is deliberately targeting civilians and engaging in massacres. The EU is now awaiting the green light from the United Nations as it prepares to do what the initial UN resolution specifically forbade – sending in ground troops in the name of “humanitarian aid”. The EU has made it clear that its troops will attack Gaddafi forces if they are impeded in any way from taking over regions in the east of the country, and securing “sea and land corridors”. Of course, the ground invasion was already unfolding before the so-called “no fly zone” was even enforced, with hundreds of British, American and French special forces troops arriving in the country at the end of February to train rebels. The humanitarian hoax was then manufactured as a veil with which to camouflage NATO’s wanton act of aggression, with the corporate media dutifully regurgitating baseless claims about Gaddafi slaughtering his own people while concocting lies about his regime using western journalists as human shields. In addition, lurid claims about Gaddafi forces bombing “protesters” from fighter jets on February 22 over Benghazi and Tripoli were completely dismissed by Russian military experts, who said that sophisticated satellite imagery from space showed no record of such actions. Asked about claims of Gaddafi violence against innocents, Professor Kuperman responded, “There is no evidence of that in the cities that Gaddafi has captured either totally or partially,” citing Human Rights Watch figures that clearly illustrate how Gaddafi forces are targeting combatants and not innocent people. “Misurata’s population is roughly 400,000. In nearly two months of war, only 257 people — including combatants — have died there. Of the 949 wounded, only 22 — less than 3 percent — are women. If Khadafy were indiscriminately targeting civilians, women would comprise about half the casualties,” writes Kuperman, adding that the only thing to deepen the humanitarian suffering of innocents was the NATO-led attack, which will indefinitely prolong the civil war. Of course, to the western media, rebels driving tanks, flying fighter jets and carrying RPG launchers are still classed as “protesters” or “civilians” in the Orwellian doublespeak world of humanitarian hypocrisy. While the corporate media has played up Gaddafi’s supposed attacks on innocent people, evidence of which is thin on the ground, videos, images and testimony of rebel fighters engaging in massacres and beatings of innocents, including children, has been universally ignored. While it’s obvious that there have been acts of brutal retaliation carried out by both sides that have killed innocent people, to claim that Gaddafi is overseeing a deliberate policy to attack innocents even as he battles against the might of NATO and the western-backed rebel forces is brazenly deceptive. Even the New York Times had to admit that the rebels were “making vastly inflated claims of his (Gaddafi’s) barbaric behavior,” and had “no loyalty to the truth in shaping their propaganda,” after the much promised “bloodbath” in Benghazi never materialized. The humanitarian hoax behind the assault on Africa’s richest oil country was invented out of whole cloth to prevent what globalist forces feared most, the defeat of their own Al-Qaeda backed rebel forces. TiVo Premiere DVR – Instantly watch HD movies & TV shows from Netflix. Unlocked Cell Phone Discounts. Free Shipping. Large Selection Unlocked GSM Phones. No Contracts. Buy Now.